(Friday, December 23, 2011) -- Today President Barack Obama signed Congressional authorization within the Consolidated Appropriations Act, 2012 (Omnibus), H.R. 2055, to bridge 5.5 miles of Tamiami Trail (U.S. highway 41) to restore fresh water flow through America’s Everglades and into Florida Bay. The new bridges will join a one-mile bridge already under construction. The Everglades Skyway, a term coined to describe the 6.5 miles of bridges along Tamiami Trail, is now supported by Congress, the President of the United States, and a strong coalition of Florida municipalities, civic and business organizations. Besides restoring Everglades water flow, the project will create thousands of jobs, increase tourism and help to protect South Florida from the ravages of climate change. 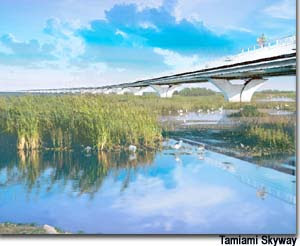 The cumulative 6.5-mile Skyway will also serve as a visible symbol of Everglades restoration. Our challenge however is not yet complete. Now that the project has Congressional authorization, it must also receive funding by Congress before construction can begin. Nonethess, today is an historic day. After 83 years, Congress has moved to restore flow across the Tamiami Trail. Today is the kind of day that Ernest Coe, the Father of Everglades National Park and Marjory Stoneman Douglas, author of the River of Grass, would hold a toast! Sen. Charles S. "Charlie"Dean, Sr.'s S 604 Fertilizer Use on Urban Landscapes will be heard in the Senate Agriculture committee Monday, Dec. 5, 2011 at 12:30 p.m. Please call the committee members and urge them to vote NO on this bill which would exempt lawn workers holding “limited certification” from any restrictions on fertilizer application. The only urban turf fertilizer restrictions in Florida are those that have been adopted by localities. This bill preempts them and will leave local governments and taxpayers defenseless against nutrient pollution from lawn applicators who apply fertilizer as part of their daily work every day. Fertilizer is a potent source of nitrogen and phosphorous which cause harmful algal blooms that threaten public health, lower property values, and damage the ecosystems necessary for Florida’s water based economic activities such as commercial and recreational fishing, and tourism. A person-to-person communication is best (visit or phone call). Be sure to ask the name of the person you speak to. More talking points are below the contact information for committee members. 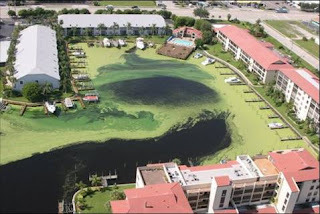 TALLAHASSEE – Earthjustice today filed a legal challenge against Florida’s Department of Environmental Protection (DEP) because the state agency is failing to protect residents and tourists from nauseating -- and dangerous -- toxic algae outbreaks. “Toxic algae outbreaks are a public health threat and they also affect Florida’s bottom line,” said Earthjustice attorney David Guest. “These outbreaks can cause rashes, breathing problems, stomach disorders, and worse. Health authorities have had to shut down drinking water plants, beaches and swimming areas. Toxic algae can kill fish, livestock and pets, and we need to be cleaning it up. After years of seeing toxic algae outbreaks on Florida tourist beaches like Sanibel Island and at fishing destinations like the St. Johns River, Earthjustice filed a Clean Water Act federal lawsuit in 2008 in the Northern District of Florida on behalf of the Florida Wildlife Federation, the Conservancy of Southwest Florida, the Environmental Confederation of Southwest Florida, St. John’s Riverkeeper, and the Sierra Club. In 2009, the EPA set numeric limits for the phosphorus and nitrogen that comes from sewage, fertilizer and manure in Florida waters. The rule that the EPA set for Florida was a “speed limit sign” that gave everyone fair notice of what specific level of pollution would be allowed in a particular water body. If the speed limit was exceeded, regulators could take action to prevent toxic algae outbreaks and green slime. But the DEP’s rule doesn’t provide that certainty, and it won’t protect public health. 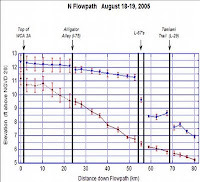 “The DEP rule basically says: ‘Well, there could be a speed limit sign here, but we need to do a study first and then we’ll decide.’ Under the state DEP rule, by the time the state takes action, a waterway is already slimed. The whole point is to clean it up before it gets that bad,” said Manley Fuller, president of the Florida Wildlife Federation. The Sierra Club offered photographic proof today of the dire need for immediate cleanup action. The Club unveiled an interactive map of Florida’s slimed waterways, which stretch from South Florida to the Panhandle. “With the help of local citizens and clean water watchdogs all over the state, the Sierra Club has compiled photos of the red and green muck that plagues too many of the springs, rivers, lakes and bays of our state. This map lets you take a photographic ‘slime tour’ of Florida – and it is not a pretty picture,” said Craig Diamond, Executive Committee, Sierra Club Florida Chapter. Earthjustice filed today’s administrative challenge in the Florida Division of Administrative Hearings on behalf of the Florida Wildlife Federation, the Sierra Club, the Environmental Confederation of Southwest Florida, St. John’s Riverkeeper, and the Conservancy of Southwest Florida. “We have a massive fish kill in Estero Bay right now, and it is happening because the state has delayed acting to solve this major pollution problem for the past 15 years. The DEP’s weak rule is just going to delay cleanup further. The DEP is just kicking the can down the road another 15 years, and that’s not fair to the citizens. We all deserve clean water,” said Jennifer Hecker, policy director for the Conservancy of Southwest Florida. Link to interactive map "Florida Slime Crime Tracker"
Washington, D.C. — Today, the Obama administration officially proposed strengthening fuel efficiency and pollution standards for passenger cars and trucks to 54.5 miles per gallon by 2025. The measure builds on a historic step taken last year to raise vehicle efficiency to 35.5 mpg in 2016 and begin reducing tailpipe carbon pollution levels. The newly proposed standards also reduce carbon emissions to 163 grams per mile in 2025. These highly anticipated standards would result in significant savings at the pump for American families, reduce climate-threatening carbon pollution and provide Americans with better and more fuel efficient vehicle choices. “Today’s proposal is a big win for American families and will prove to be a big boost for our economy. President Obama has secured a decade of progress toward breaking our dangerous addiction to oil, creating American jobs, curbing life-threatening pollution and tackling climate disruption. American families will see much-needed relief at the gas pump as the auto industry moves toward a better, more efficient generation of American cars. “To put it in perspective, in 2030 these standards will save American families $44 billion at the gas pump, reduce our oil use by 23 billion gallons, and cut carbon pollution by an amount equal to the annual emissions from 72 coal-fired power plants – and that’s all just in one year. “Fuel efficiency and pollution standards for passenger cars and trucks are just one critical piece of the equation for ending our addiction to oil. This new standard will put American innovation and technology to work to deliver the best cars and trucks for consumers, but we must also ensure smart transportation choices such as transit, biking and walking for all Americans, and build livable cities and communities. HB 421 Limited Certification for Urban Landscape Commercial Fertilizer Application by Rep. Jimmie T. Smith will be heard Tuesday in the House Agriculture and Natural Affairs Subcommittee on Tuesday, November 15, 2011 at 1:00 p.m. Please call the members of the committee and urge them to vote NO on this bill which would exempt lawn workers holding “limited certification” from any restrictions on fertilizer application. The only urban turf fertilizer restrictions in Florida are those that have been adopted by localities. This bill preempts them and will leave local governments and taxpayers defenseless against nutrient pollution from lawn applicators. TALLAHASSEE – The U.S. Environmental Protection Agency’s thumbs up today for Florida’s polluter-friendly water quality rules is a loss for families who deserve clean water. Today, the EPA sent a letter to the Florida Department of Environmental Protection announcing its preliminary approval of draft state regulations on sewage, manure and fertilizer pollution. This preliminary approval is being given by the EPA without that agency’s having reviewed the technical comments provided by Florida’s water quality advocates. “EPA caved to congressional pressure to put polluter interests above those of the Florida public. Who will be the losers? Local waterfront communities, homeowners with sinking property values, and everyone who fishes, swims, boats or drinks water in the state” said Frank Jackalone, Florida Staff Director of the Sierra Club. The FDEP proposed rule takes all the pressure of the state’s biggest industrial polluters and instead places it on taxpayers and local governments; it also gives the state legislature complete control over the future of Florida’s water resources, including the ability to defund the implementation and enforcement of the rule. The state’s Environmental Regulation Commission will hear a presentation on the DEP’s draft rule at a meeting in Tallahassee tomorrow. If the ERC signs off on the draft rule, it goes before the Florida Legislature in the 2012 session. The EPA will then have the opportunity to approve or deny the state’s final rule. Earthjustice filed suit to compel the EPA to set limits on sewage, manure and fertilizer pollution in 2008 in the Northern District of Florida on behalf of the Florida Wildlife Federation, the Sierra Club, the Conservancy of Southwest Florida, the Environmental Confederation of Southwest Florida, and St. John’s Riverkeeper. For St. Petersburg Times Editorial, click here. Florida consumers will save $4.2 billion dollars in 2030 (3rd most in US) under new fuel standards. [Miami, FL] – New fuel efficiency standards for cars and light trucks will save the average Florida family $371 at the gas pump in 2030, according to a new analysis www.go60mpg.org/docs/NRDC_UCS-State_by_State_Savings-FINAL_9-11.pdf released today by the Sierra Club. The analysis, from the Union of Concerned Scientists and the Natural Resources Defense Council, also finds that the Obama administration’s proposed fuel efficiency and carbon pollution standards for cars and light trucks will save Floridians $4.2 billion overall, cut the state’s oil use by 2.1 billion gallons and reduce carbon pollution by 24 million metric tons in 2030 -- equivalent to avoiding the carbon pollution of 6 coal-fired power plants in that year. In July, President Obama announced his outline for the new model year 2017-2025 standards, which will ensure that new cars and light trucks average 54.5 mpg and reduce tailpipe carbon emissions to 163 grams per mile by 2025. Due to outdated testing methods, the 54.5 mpg standard will mean consumers in 2025 can expect new vehicles to average approximately 40 mpg on road. Nationwide, the UCS/NRDC analysis projected that these standards will save Americans $44 billion by 2030, cut oil use by 23 billion gallons, and cut carbon pollution by 280 million metric tons—making this the biggest single step this country has ever taken to move beyond oil and tackle climate disruption. The outline was applauded by the majority of automakers and the United Auto Workers, as well as numerous environmental and consumer groups. The Sierra Club also called on the Obama administration to avoid including loopholes and industry giveaways in the final standard that would undermine consumer savings and pollution reductions. The Administration is expected to officially propose the standards in mid-November and finalize them by next summer. This FDEP draft rule has been embraced by many opponents of the EPA Rule for the obvious reasons: 1. It would allow the continued discharge of sewage, animal manure and fertilizer pollution into most of the state’s water resources; 2. It would keep the burden of prevention and clean-up costs on the taxpayer and off industry polluters; and 3. It would give the state legislature control of the nutrient pollution issue. However, FDEP has made it clear throughout the drafting process that the decision to go forward with rule-making depends on having public support to do so. We have the opportunity for the next 3 weeks to bombard FDEP with comments against the draft rule and prove that Floridians do not want less protection for our water bodies but rather, we want more protection. We can send a clear message to FDEP if we mobilize ourselves, our members and our allies. Comments can be provided directly on the webpage (2000 character limit) or posted as attachments to the webpage. The link to the public comments webpage is here. Comments opposing the FDEP draft rule should be submitted by October 18. The “deadline” for technical comments on the draft is Wednesday, September 28. You can view the comments submitted to FDEP on their proposed rule by way of the Department’s nutrient criteria webpage here. Read more for a Policy Alert that includes some easy talking points. Washington, D.C. – Today, President Obama announced that he has requested that the U.S. Environmental Protection Agency (EPA) withdraw the draft Ozone National Ambient Air Quality Standards that would have protected Americans from air pollution. "A healthy economy requires clean air and healthy people, and these protections from smog would have improved our communities and saved billions of dollars in health costs. Half of U.S. families live in places where it is literally unsafe to breathe the air, and kicking the inhaler down the road will do nothing to protect our children. "We thank the scientists and public health professionals at the EPA for their commitment to science, and we look forward to the day when strong clean air protections will prevent thousands of premature deaths and tens of thousands of asthma attacks. The Sierra Club and the millions of Americans who have suffered through orange and red-alert air quality days this record-breaking summer will continue to push the Obama Administration to improve this protection in order to save lives and clean up our air." 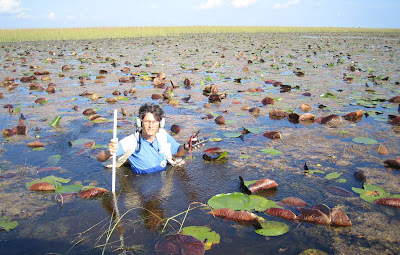 Dr. Christopher McVoy, here doing Everglades research, is now unemployed. This month, Florida Governor Rick Scott and the Republican-controlled Legislature completed their initial dismantling of the staff of the South Florida Water Management District (SFWMD), the state agency charged with protecting the Everglades. In all, 280 employees are gone, 60 percent of those in management. (Note: Similar attacks are being carried out at the other state water management districts.) At the South Florida District, it wasn’t a blind, belt-tightening decision. It was an attack on science and more specifically an attack on Everglades restoration. 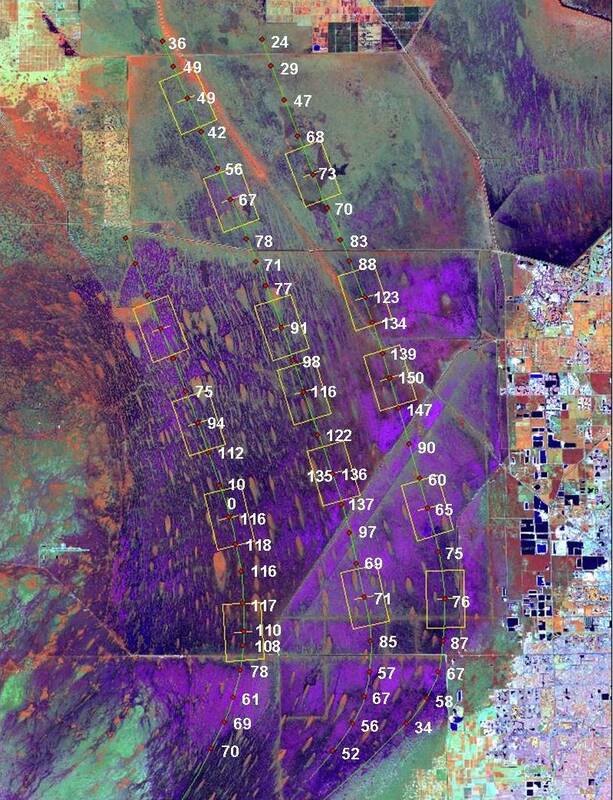 One of the scientists laid off was Dr. Christopher McVoy, a Ph.D. in Soil Physics from Cornell and lead author of the recently published 576-page book Landscapes and Hydrology of the Predrainage Everglades. Dr. McVoy, whose 15 years of working at the District ended two Fridays ago, conducted cutting-edge research on how the Everglades functioned. 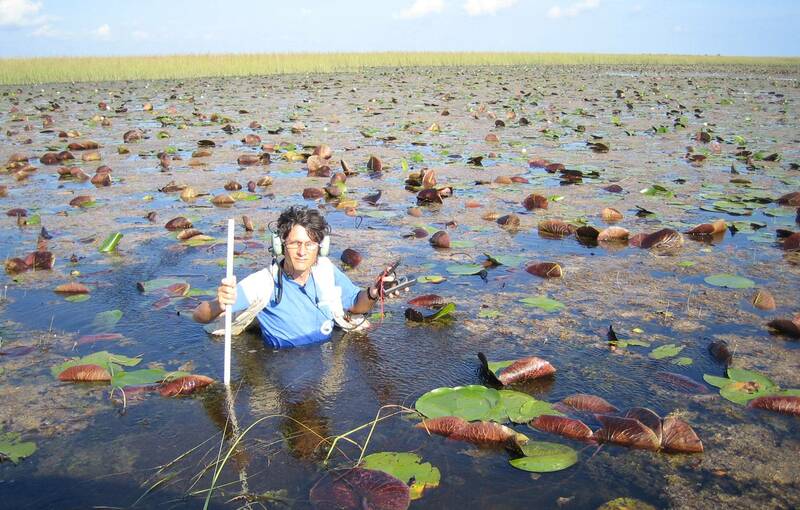 His breakthrough research showed that the key factor in restoring the Everglades was restoring its water flow. 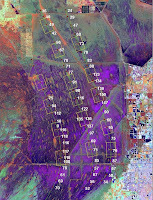 Dr. McVoy focused on the central landscape of the Everglades called ridge and slough, the deposition of sediments by a lattice of little rivers forming tear-shaped islands. He was a detective, probing black and white pictures taken from blimps, looking for clues, anything that could tell us what the Everglades was supposed to look like today. He discovered that unrestricted water flow was the life-blood of the Everglades and that only by removing the north-south barriers could we restore the giant wetland. 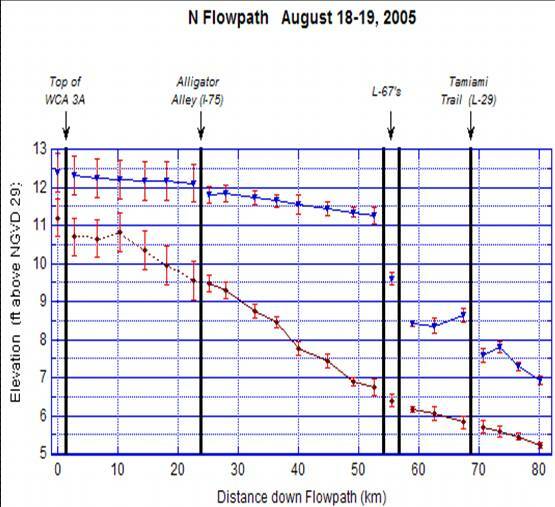 Dr. McVoy’s work also probably played a part in Governor Crist’s decision to purchase sugar lands in the Everglades Agricultural Area to help restore Everglades water flow through contiguous reservoirs and Storm Water Treatment areas and over time establish a flow-way through the EAA. It would be simpler if this was just a story about Dr. McVoy, but it’s not. It’s about something broader and more worrying. Dr. McVoy’s departure was part of a systematic dismantling of environmental regulatory agencies throughout the state. It was a direct attack on nature. As Dr. McVoy joins the hundreds of South Florida scientists who lost their jobs trying to restore America’s Everglades, we have only one question to ask: Who will restore the Everglades without them? ON THE AFTERNOON OF JULY 11, yet another Florida panther was discovered lying on a lonely stretch of Immokalee Road, an east-west corridor that cuts through cattle and farm country in rural Florida. The year-old male was the 7th big cat killed by a vehicle this year and the 19th killed overall, a rate that is set to outpace the 23 deaths in 2010 and 25 in 2009. That late-night collision continued another unsettling trend. For the past decade, cars have been the leading cause of known panther deaths, surpassing panther-on-panther aggression. The increasing human traffic within panther territory is taking its toll. Only weeks before the accident, the U.S. 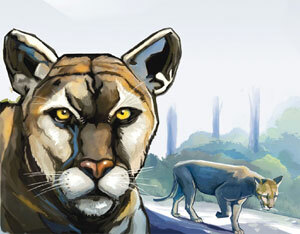 Fish and Wildlife Service had declared the Eastern cougar—which hadn't been seen in decades—extinct. That leaves the Florida panther, itself on the threshold of extinction, as the eastern seaboard's sole surviving big cat. Only 100 to 160 adult Florida panthers live in the wild today, according to government estimates. Roughly 20 percent of that population is killed off annually—a number barely replenished by yearly litters. Puma concolor coryi once prowled the Southeast as far west as Missouri. But the growth of subdivisions curtailed the big cat's range to South Florida's sodden hinterlands. Female panthers roam territories as large as 75 square miles; males, up to 200 square miles. They need that space, especially the fiercely territorial males, which regularly kill trespassing competitors. As panther range shrank, so did their numbers, dipping down to the 30s in the 1980s before protection efforts ramped up. That's when the Texas cougar, a genetic cousin, was introduced to Florida to diversify the DNA and avoid inbreeding. The Sierra Club has sued the federal government to get it to designate 3 million acres as critical habitat for the panther. This would broaden the government's power to control development in those areas. A judge dismissed the lawsuit on jurisdictional grounds earlier this year, but Club lawyers are appealing. Environmental groups in Florida are divided on the question of new development in panther territory. Some are seeking compromise, agreeing to accept some construction in exchange for new protected areas. The Sierra Club, on the other hand, opposes all new development where cats roam. 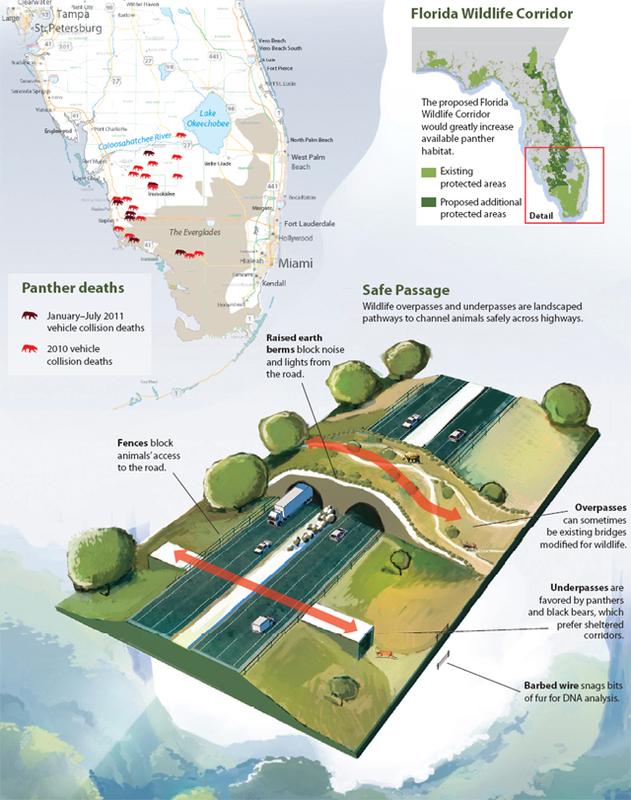 "If you bring new people and cars into panther habitat, you'll kill panthers," says Frank Jackalone, the Sierra Club's senior organizing manager for Florida. "It's as simple as that." TRISTAN KORTEN is a journalist who lives in Miami. This article was funded by the Sierra Club's Resilient Habitats Program. ORLANDO -- U.S. Rep. Cliff Stearns, R-Ocala, has sided with polluters and is refusing to invite any clean-water advocates or members of the public to testify at an Orlando Congressional hearing he is holding next week to discuss EPA’s proposed limits for sewage, fertilizer and manure in Florida waters. “If Stearns wants to hear from his constituents, he should make room to hear from business owners and residents who have endured the public health threat posed by toxic algae outbreaks and fish kills at dozens of cold-water springs, at Sanibel Island, Naples, Daytona, and other tourist beaches, and along the St. Lucie, Indian St. Johns and Caloosahatchee Rivers,” said Earthjustice attorney David Guest. Stearns’ one-side hearing of the House Energy and Commerce Subcommittee on Oversight and Investigations, called “EPA’s Takeover of Florida’s Nutrient Water Quality Standard Setting: Impact on Communities and Job Creation,” will be held at 10 a.m. Aug. 9 at the University of Central Florida Alumni Center in Orlando, 4000 Central Florida Blvd., Building 126. On behalf of our 1.2 million members nationwide, which includes more than 75,000 members across the five Gulf Coast states, we are writing to express our appreciation for your continued support on Gulf recovery issues, and to respectfully ask that you strengthen the current Gulf legislation being considered by the U.S. Senate Committee on Environment and Public Works (EPW). Over the past sixteen months, the Sierra Club has worked alongside our members and allies to ensure that the effort to restore the Gulf of Mexico’s ecosystems, communities, and economies is driven from the ground up and guided by the principles of transparency, accountability, and independent science. The Sierra Club has advocated strongly for a public seat at the decision-making table, recognizing that widespread feelings of mistrust and lack of transparency continue to color restoration and slow recovery efforts. We appreciate that the RESTORE the Gulf Coast bill currently under consideration by EPW would direct 80% of the anticipated Clean Water Act (CWA) fines levied against BP to the five Gulf Coast states. Indeed, this reflects Secretary Mabus’ and the National Oil Spill Commission’s recommendations as well as the repeated requests of countless NGOs and Gulf leaders, including the Sierra Club. The Sierra Club, however, believes the current bill is missing several elements that would ensure meaningful coastal restoration and recovery of the Gulf’s ecosystems and communities. We respectfully request EPW add the following provisions to the bill to address these serious deficiencies. Creating a Science Advisory Committee comprised of independent scientists from around the Gulf Coast to provide input on restoration project selection, implementation, and monitoring processes. Requiring an annual legislative audit by the Government Accounting Office or an independent auditor located outside the five Gulf states. Ensuring the full application of the Administrative Procedures Act. Ensure the full application of NEPA by requiring the Gulf states and the Gulf Coast Ecosystem Restoration Council to establish formal public comment periods and holding public hearings during the development of the Comprehensive and State Plans as well as all proposed restoration projects and programs. Create a permanent Regional Citizens’ Advisory Council (RCAC) comprised of community leaders and stakeholders from the affected Gulf states to improve communications and provide long-term oversight of future oil industry actions. Ensure that all plans and projects developed and implemented under the statute are consistent with the goals and processes of the Natural Resource Damage Assessment and the Gulf Coast Ecosystem Restoration Task Force, and are approved by the Gulf Coast Ecosystem Restoration Council. A Stop Gap/Do No Harm clause is necessary to ensure funds prioritize ecosystem restoration over economic development, such as: “Amounts provided under this bill may not be used for activities that destroy or degrade the health, diversity, or viability of natural coastal or marine ecosystems” and “No more than 10 percent of the funds received by a state in any fiscal year may be expended on projects that are primarily intended for economic development rather than restoration of the natural coastal or marine ecosystem” (Note: A definition of ‘economic development projects’ also is necessary). Section 4 that deals with 30% Impact Formula Allocation with Oversight by the Council allows for the states to bring the Secretary of Treasury to Federal Court if the Council fails to act within sixty days or disapproves a project. This language is burdensome and creates a hostile atmosphere for decision-making. Section 5 that identifies disciplines for grant monies annually awarded by the Gulf Coast Centers of Excellence includes, “Offshore energy development” and “Sustainable and resilient growth, economic and commercial development”. This language does not appear aligned with the principles of ecosystem restoration. We appreciate your consideration of these issues and look forward to working with you to restore the Gulf and its communities. Thank you for considering this important request. If you have any questions or need further information, please contact Jill Mastrototaro, Gulf Coast Protection Campaign Director, at jill.mastrototaro@sierraclub.org or (504) 861-4835. Congressman Stearns turns against EPA water rules - Was it cash or tea? We were very surprised to learn that Congressman Cliff Stearns will hold a field hearing of the House Energy and Commerce Subcommittee on Oversight and Investigations on August 9th at 10 am at the University of Central Florida Alumni Center in Orlando. Stearns, who chairs the subcommittee, chose to title this hearing as "EPA's Takeover of Florida's Nutrient Water Quality Standard Setting: Impact on Communities and Job Creation." "I am very concerned about preserving the Silver River in my hometown [Ocala] as well as the Ocklawaha and the St. Johns rivers in my district...Although I don't want to see the EPA develop these burdensome and expensive regulations, I do want the EPA and the State of Florida to work together in developing an economical solution to protecting our waters." Sierra Club praised Stearns for showing "significant courage, risking retaliation not only from the polluters' cabal and agricultural interests in his rural district in North Florida, but also from the Republican leadership of the House of Representatives which attached dozens of anti-environmental riders to the Continuing Resolution." It looks like the retaliation Sierra Club predicted was, indeed, too intense for Stearns. He caved to the pressure, and one can only wonder what did the trick. Was it campaign contributions, robo calls from the tea party or a threat from deep-pocketed polluters that they would find a serious opponent to run against him in the next election? Click on "Read more" below for Stearns' announcement of his field hearing. It's clear he's now taking sides and no longer sees a role for EPA to make sure that Silver River, the St. John's River and the Ocklawaha River are cleaned up and protected. Thank the Obama Administration for proposing strong standards and ask that the rule be free of loopholes. Last Friday, President Obama announced a proposal for strong fuel efficiency and carbon pollution standards for cars and trucks of 54.5 miles per gallon by 2025. Once finalized, this standard will save us money at the pump, reduce life-threatening carbon pollution and provide Americans with better and more fuel efficient car choices. We know that automakers can do better and meet our 60 mpg target, but the president's announcement is a strong step toward ending our dependence on oil. You made this progress possible. Together we sent over 300,000 messages — including our photo petition1 -- to President Obama, the EPA and DOT, showing that reducing oil dependence and carbon pollution through better fuel efficiency is a high priority for Americans across the country. This announcement is a win for everyone, but there is still more to be done! Thank the Obama Administration for taking action to cut our dependence on oil and curb dangerous carbon pollution. Then, urge them to keep loopholes that weaken the standards out of the final rule. Check out the photo petition we delivered to President Obama!